If you're in Amsterdam before 6 December, you should take the time to visit the #SOBERCOLLECTIVE exhibition at the new Original Dampkring Gallery (of certain repute). 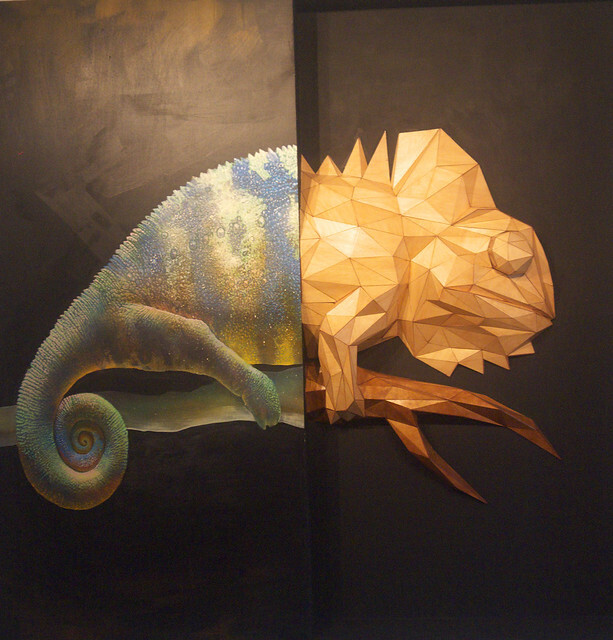 The chameleon is iconic, marrying the photo-realistic colouring of the Telmoniel artists with the algorithmic precision and dexterity of the Sober Industries team. The combination of 2D and 3D in some of the pieces works really well, giving the impression of an outside/inside view of the same subject. The huge cat appears to stalk the room. The hand, in Vulcan pose, suddenly appears other-worldly. The 'wheel thing' is hand-drawn, and, like the other paper sculptures, laser-cut. I wish that I'd taken a closeup The chameleon is probably my favourite piece - not surprisingly, it's the one featured on the promotional material for the exhibition. The crab runs a close second, maybe because of my birthday - I'm a Cancer. These are my photographs from the Sober Industries & Telmoniel / #SOBERCOLLECTIVE exhibition - 16 October to 6 December 2015 at the Original Dampkring Gallery at Singel 395, Amsterdam, Netherlands, but copyright remains with the artists. Here's a link to these higher-definition images on Flickr. The slideshow will be revealed in a few seconds. I've also uploaded them to Slideshare here. Photographs from the Sober Industries & Telmoniel / #SOBERCOLLECTIVE exhibition - 16 October to 6 December 2015 at the Original Dampkring Gallery at Singel 395, Amsterdam, Netherlands.